I have recently gotten a hold of several Samsung TVs with bad backlights. Unlike LG TVs which shut down the backlight if failures are detected, Samsungs will continue to run leading to failure of almost every LED. Damage to the power supply could also occur. For most Samsung TVs, disconnecting the cable from the main board to the power supply board should light up the backlights. Here is a list of models and the corresponding LED strip part numbers I have encountered . UN46H5203AFXZA, UN46EH5300FXZC – LM41-00001X / LM41-00001Y or D3GE-460SMB-R1 / D3GE-460SMA-R2 or BN96-28769A / BN96-28768A I have encountered damage to power supply BN44-00771A (traced to a bad diode D9801C) on one TV. I’m on my second hot water tank in my house and it is at the 9yr old mark. When I replaced it last, I paid for the longest warranty tank since installation costs have gone up over the years. Hot water tanks will eventually rust out and leak. Watching This Old House, there was a segment on extending the life of your hot water tank by replacing the anode rod. This part prevents your tank from rusting prematurely and should be inspected and replaced. I was able to purchase an anode rod at Lowes. Removing the old anode rod was difficult since it was very tight and I had limited space to work in. Luckily, I had a friend with an impact wrench and compressor and it was needed to get the old rod out. I included a pic of what the old rod looks like after 9 yrs in Metro Vancouver water. Poking around the intake manifold valve at the left side of the engine cover, I found one of the connectors in front of the valve wasn’t pushed in all the way. The connector can be seen in this youtube video at the 1:03 mark. I plugged the ODB2 sensor, revved up the engine past 5000 rpm and the error had cleared. I had recently flew to Bangkok with China Eastern through Nanjing Airport. Though a visa is typically required to enter China (10 yr visas are available), a visa free transit policy was introduced a few years ago offering up to 144 hours depending on the city. See this link. I emailed China Eastern to confirm Nanjing Lukou was visa free and was sent this link confirming visa free transit is available. Nanjing Lukou NKG is a large airport but not very busy for it’s size. A sign indicates it does not have a transit area. Typically, airports will have a way to go from the arrival area directly to the departure area with screening for transit passengers. On arrival, you need to indicate you are transitting without a visa to the customs officer. You do not need to fill out any paperwork and the officer will collect your passport and direct you to the waiting area with the other transitting passengers from your flight. If you have a visa, you need to fill out a departure (yellow) form. If you want to leave the airport through the 144 hr visa free transit, you also need to fill out a blue form to apply for it. Once all the passengers from your flight are processed, your group will be lead to pick up your luggage from baggage claim and then head upstairs to recheck your luggage back in. They will also print your boarding passes at this time. You will then be lead as a group to departures immigration where they will return your passport and you can go through security to the departures area. You still need to fill out a yellow departure form. Though the staff speak English, they do have difficulty pronouncing names so someone should volunteer to help them read off names. There aren’t a lot of food options post-security. Just a noodle restaurant (accepts Visa credit card) and a Subway. Update: As a bonus, I got mileage credit on Delta Skymiles because China Eastern is a partner airline. They only gave credit on half the flights so I had to make a request for the missing mileage. This TV attempted to turn on (the front LED would flash) but there was no backlight. With the main board cable disconnected from the power supply board, the backlights came on confirming the power supply and backlights were good. This test indicated the problem was with the main board. Searching the part number BN94-05113J on ebay found a few expensive used boards and one repair service indicating the board suffers from BGA connection failures on the main processor. Shopjimmy had a long list of substitute boards and I was able to find a more reasonably priced one searching the BN97-06022A part number. This board part number was BN94-05038B and was from the 40″ version of this TV UN40D6000SF. With the new board installed, the TV turned on and also didn’t need anything changed in the service menu. This model didn’t have built in wifi (requires dongle or wired ethernet) and youtube is no longer supported. This TV turned on but the backlights were very dim. Disconnecting the cable from the main board to the power supply board had the backlight light up but at the same dimness. Probing the connector to the LED strips with an LED tester got very low voltage and unusual readings. Searching the power supply part number BN44-00771A on Shopjimmy got a warning that this model was prone to LED backlight failure. With the TV apart, I could test the strips directly and over 50% of the LEDs had failed. Some were visibly black. I have found new replacement strips on Aliexpress (search 2013SVS46) which have been ordered. With Samsung TVs, the power supply appears to not shut down the backlight when there is a LED failure unlike with LG TVs. This appears to lead to a higher number of LED failures since people will continue using their TVs. Hopefully, there is no damage to the power supply board with so many shorted LEDs. I previously had to do a full backlight replacement on model UN50EH5300F with one or two LEDs out on every strip. Update: The strips came in and TV has been repaired. I checked the screen settings and the TV had been running in Dynamic mode which runs the backlights at maximum brightness. There is an option in the settings to apply the picture settings to all sources when I reduced the backlight level to 12. The LED strips I purchased from Aliexpress were from seller KCLCD Store and the brand is Rzconne. It was shipped using tracked epacket. When the power button is pushed, the front LED blinks but the TV doesn’t turn on. Unplugging the main board from the power supply, the backlight flickers. Checking the strips with an LED tester, they all test good. The voltage across the leads on the big main capacitor go the expected 390VDC. Checking other voltages, B5V was at 5.2V but B13V was unstable drifting around 11V +/- 1VDC. Since B13V supplies the LED driver IC, this unstable voltage was causing the flickering. BN44-00645A. The suffix is usually a different revision but compatible part number. Checking the components around the unstable part of the circuit, the capacitors all tested good. Since I couldn’t find the fault, I ended buying a replacement board on Aliexpress. With the new board installed, the TV powered up. I have a stand for a 50LN5750 that was missing screws from the base to the upper support. The manual describes them as P4 x 25mm. They are actually pan head Phillips self tapping screws (4mm diameter). LG part number appears to be FAB31740201 and a part site wanted a whopping $5 each with $10 shipping. Found some good suspects on Ebay shipped from China (search M4x25mm self tapping) but ended up finding some locally from a LG dealer. In a pinch, the closest imperial screw is a #10 – 1″ which is 4.8mm diameter and the thread pitch is a little wider. The screws to mount the stand to the TV are standard metric machine screws and the part numbers can usually be found in the user manual. Got this monitor in which didn’t turn on. It uses an external AC power supply as most LED monitors. The TV has only one main board inside and I was able to find a used on on ebay. Part number BN94-07215A. When the replacement arrived, the monitor behaved exactly the same and didn’t turn on. 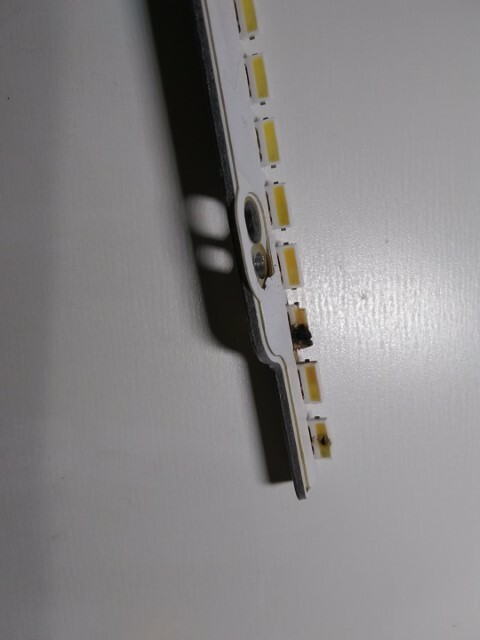 I then noticed the connector to the LED backlight had broken off and was not making contact to the edge lit strip. I disassembled the panel down to the strip but improperly mounted the connector back and overworked the solder pads. During testing, something shorted on the main board as well and I had burning component smell from it. There is a small blue led in the bottom right corner and it can be configured to be on with the monitor on or in standby. If you don’t know the current setting, it can be confusing to determine if the monitor is on or off if the backlight doesn’t come on. Since I had the second main board, I was able to find a replacement edge lit strip on Aliexpress. Once installed, the monitor worked with everything put back together and I am able to upgrade from my reliable 22″ Samsung LED monitor. It would be nice to have a 1440p or 4K monitor since the 27″ just gives bigger pixels at 1920×1080 resolution. This TV turned on but had no backlight. The owner indicated the TV was set to dynamic mode which cranks the backlight level to maximum. With the TV opened up, visible damage was found on several LEDs on the left strip. The right strip tested good with an LED tester. Searching the part number 2012SVS55 7032NNB LEFT76 2D (hidden beneath a covering label) found a similar part with a 3D suffix and a 10 pin connector. The 2D version uses a 6 pin connector and I wasn’t able to find this version online. I did have 3D strips salvaged from another TV. With the 6 pin connector, only 3 pins are used and the entire strip can be lit by applying power across pins 1 or 2 and pin 5. The strip has 76 LEDs wired as 4 separate banks of 19 LEDs. Two banks are wired in series and these in turn are wired in parallel giving approximately 114V (38 x 3V) drop across the entire strip. Wires going to the left strip were black (-), black (-) and white (+). To create a single strip, I shorted pin 3 to pin 4, shorted pin 7 to pin 8 and wired black wire to pin 1, black wire to pin 6 and white wire to pin 10. If I kept the original cable to the 10 pin LED strip, it would have made wiring easier. Another option would have been to replace the LEDs themselves but my reflow station was melting them and a hot plate may be needed to replace them. They are surface mount and appear to be part TS731A (lots of sellers on Aliexpress). With the TV assembled, I did notice some mistakes I made during reassembly. I left some finger prints on the clear plastic panel which were visible on the screen if the image was clear and light. I also had tore edges of the reflector white backing paper behind the plastic panel. I had taped the torn pieces back up but it created some bright spots on the edge of the screen. For disassembly instruction on Samsung edge-lit TV’s, see this post.